Our next stop on my tour of the lovely mansion, Blairsden, site of the 2014 Mansion in May in Peapack-Gladstone, New Jersey, is called ‘Afternoons of Wine and Chocolate’. Don’t you just love that name? It brings up such evocative images of an aristocratic lady, lounging on a daybed, eating bon-bons! The designer for this space is Maria Bevill. 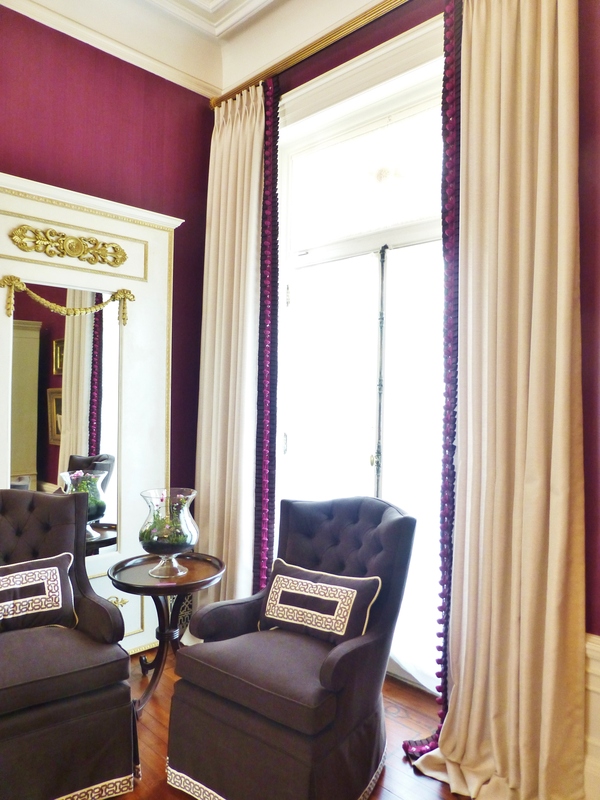 I must admit, when I first approached this space and saw the plum-colored walls, I thought…”Wow, I’m not sure I’m going to like this burgundy room.” But once inside, the skillful use of contrast won me over! The designer used a very strong color on the walls and selected bright white furnishings to be used throughout. The merlot-colored walls have a strie effect, adding texture and interest to the strong coloring. Bright white furniture provides high contrast. 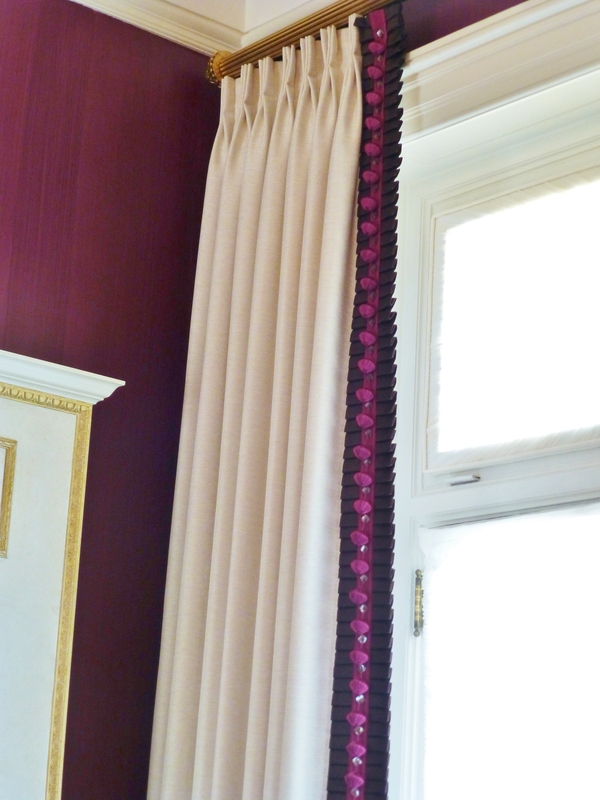 I really like the plum velvet dressing screen with its gold nail-head trim, as seen in the corner of the above photo. Ms. Bevill used gold accents throughout the room, creating a bit of glamour in the space. This corner of the room, gives a sense of the high-ceilings in all the rooms at Blairsden. The scale, in even the tiniest spaces, feels very grand, and designers were required to use appropriately sized furnishings in their rooms. I love the white and gold trumeau mirror in the above photograph! It draws the eye upward, to create a smooth transition with the tall draperies. And did you notice those window treatments? Solid white pleated draperies continue the play of contrasts with the dark walls. These simple window treatments are treated to luxurious trim at the leading edge. 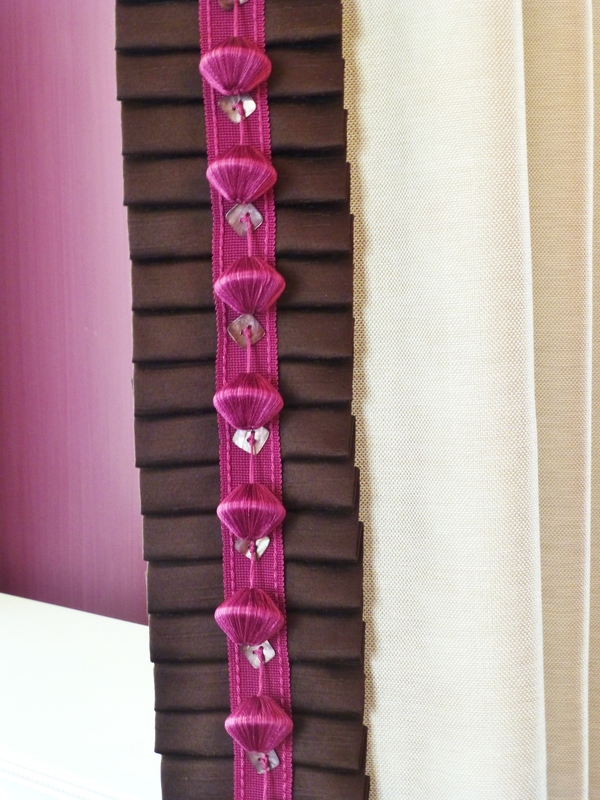 Here’s a detail of the drapery’s leading edge: A pleated band of chocolate fabric, with a fuscia bobble & pearl button fringe on top. This just makes the draperies, don’t you think? There are a few more things which you should note in this photograph. The amazing artwork, which speaks to both the room’s theme and the color scheme. Also, the terrific cocktail table, amazing venetian glass chandelier and (just barely seen at the top) the fantastic handpainted ceiling. So….what did you think of this dramatic room with high contrast? Please take the time to leave me a comment, I love to hear from you! Until next time, tell everyone you know about Kristine Robinson’s Blog–I need all the friends I can get! This entry was posted in Color, Designer House, Draperies, Furniture, Home Decor and tagged Burgundy, Chandelier, Curtains, Decorating, Design, Fabric, Fringe, Furniture, Interior Decorating, Interior Design, Interiors, Mansion in May, Wine. Bookmark the permalink. Love the color scheme! So elegant and timeless. I really love the color! Very feminine. I just stumbled upon your page, I am from Jenkintown PA as well! Thanks for touching base! Jenkintown is an awesome place to live! !